University of Mobile student Kathryn Gosselin and Mark D at L’Arche during today’s Project Serve. MOBILE (Kathy Dean) — University of Mobile sophomore Kathryn Gosselin and 50-plus-year-old Mark linked arms, twirling first one direction then another, dancing in the center of the activity room. 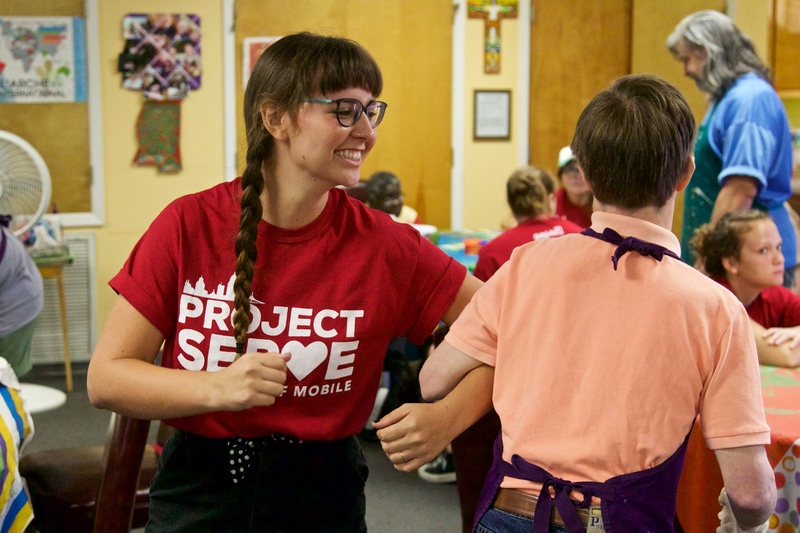 Beside them, university students in red Project Serve T-shirts worked at tables on crafts with residents of L’Arche, a community of people with and without disabilities that share life together. Kathryn was one of nearly 1,300 students, faculty and staff at the Baptist university in north Mobile County that took a day off from classes on Sept. 25 to volunteer at 63 locations across two counties. It was the 5th annual Project Serve, a university-wide effort to celebrate volunteerism, community and faith. Students serve side-by-side with their professors, coaches and university staff to share God’s love through the skills and knowledge they are gaining in the classroom. This entry was posted in Home and tagged Mobile, Project Serve, service, students, UMobile, University of Mobile. Bookmark the permalink.